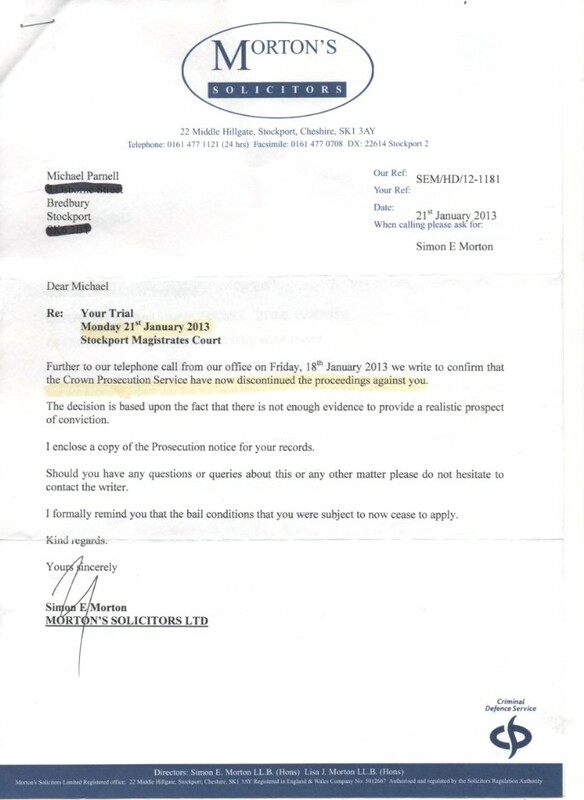 Having read the Code for Crown Prosecutors, I am at a loss to understand how Mr Parnell's case ever came to court. I had to pay; I am a bit cross. 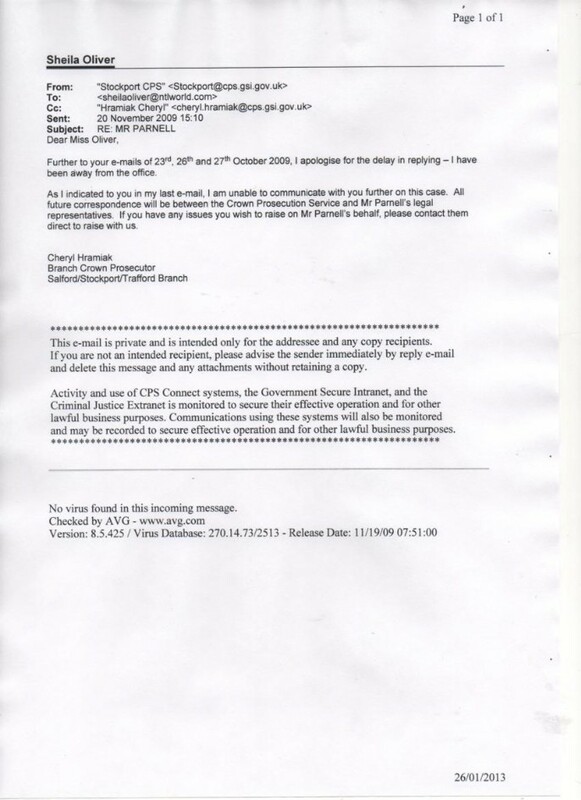 Stockport CPS had a legal obligation to abide by this code. I suggest you stop bringing these malicious prosecutions. Section 3.3 states that the prosecutors have to, where possible, rectify the evidential weaknesses. The CCTV shown in court clearly showed there was no offence. If the evidence does not support the case, then the case should be stopped. When the CPS reviewed the CCTV footage of the alleged assault with a sneeze and there was no sneeze, the case should have been stopped. If the case relied on witness statements and these weren't sufficient, the case should be dropped. The Council witnesses lied in court. It was obvious the whole case was a fabrication from the outset. Each case is subject to the full code test, which consists of the evidential stage and the public interest stage. Section 4.5 shows the prosecutors must have sufficient evidence to ensure a conviction against a defendant at this stage. The prosecution has to examine the defence case . If a case does not pass the evidential stage, then it should not continue. There was no evidence of any sneeze on the CCTV and may I say at this stage what an utterly stupid charge this was anyway! Section 4.7 subsection c - regarding the suspect being seen as a bad character. The evidence needs to be reliable. Mr Parnell in all his life had never, ever been in trouble before, apart from his dealings with this, in my experience, corrupt council. Does any evidence go against the evidence of the witnesses? The CCTV showed it to be a lie. When prosecuting a suspect it has to be considered whether it is in the public interest to prosecute. And it was in my interests to spend vast sums of money on this case - how exactly? It has to be considered whether the witnesses could have taken a dislike to the accused and fabricated evidence against them. That would appear to have been the case here, and may I mention at this juncture that the court accepted evidence of and the witnessed themselves admitted to such statements as - I will kick your f*cking head in. Nice words indeed from employees of Stockport Council. I respectfully suggest that no further sham prosecutions are brought against Mr. Parnell. Mercifully and belatedly the police have stopped arresting him. If you prosecute him again (unless he commits a genuine crime, which is unlikely) believe me I will have you all for that. You can't bring a case if you know the witnesses to be unreliable. You are now fully aware that witnesses from Stockport Council are unreliable. Shot across the bows there.